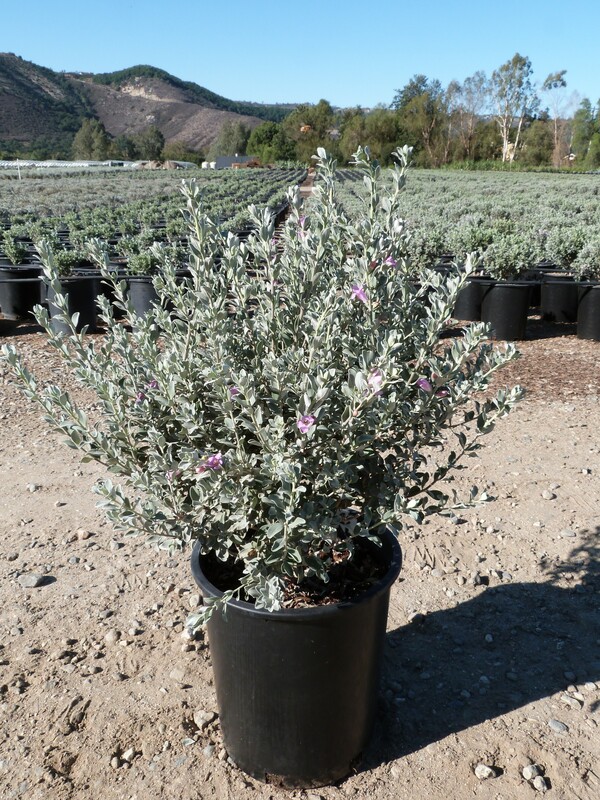 Silver gray evergreen foliage, prolific lavender flowers and excellent drought tolerance make Leucophyllum frutescens ‘Compacta’ a great choice for low maintenance contrast in your landscape. Reaching five feet at maturity, ‘Compacta’ is a more manageable size than other Leucophyllum species, which can grow eight feet or more. Native to the Chihuahuan Desert in Mexico and west Texas, this water-wise plant is also known as Texas Sage. Sometimes called the “barometer bush,” Texas sage responds to summer rains and high humidity with a flush of blooms that attract bees and butterflies. It’s a larval host plant for the Theona Checkerspot butterfly and the Calleta silkmoth. Use as a hedge or as a specimen plant to add height in a perennial border. Performing best in full sun, it will tolerate partial sun and a variety of soils, as long as they are very well-drained. Poor drainage can result in susceptibility to cotton root rot, but it’s otherwise free of pest and disease problems. Add Leucophyllum frutescens ‘Compacta’ as a water conserving beauty to your landscape for year round interest.